Given the complicated status of the Texas A&M coaching staff, I decided to go back and look at how teams with coaching issues performed in last year’s bowls. The results won’t thrill NU fans, but a couple of interesting trends can be observed, and there is hope for a decrease in performance. Sendoff – these coaches have either retired, resigned, or in some cases been fired, but are generally coaching their teams’ bowl game as a last hurrah after a relatively successful or long tenure. The two examples from the 2010 bowl season were Ralph Freidgen at Maryland, and Urban Meyer at Florida. Both teams obliterated their opponents. Lame Duck – these coaches are presumed to be losing their jobs, often regardless of bowl outcome. Last year’s examples were Rich Rod at Michigan and Bill Stewart at WVU. (note, Stewart was not fired immediately, but going into the bowl Dana Holgerson had already been hired as OC and “head coach in-waiting”). Both Michigan and West Virginia laid eggs for their lame duck coaches. Interim Coach – Promoted: This category includes schools where the head coach left for another job — NIU (Jerry Kill) and Miami (OH) (Haywood). It seems that these teams are often galvanized by the departure of their head coach (WVU post Rich Rod a few years ago comes to mind as well), and play extra hard for the interim coach. NIU and Miami both dominated their opponents last year despite close to even odds placed on their games by Vegas. Miami Hurricanes — Randy Shannon was fired after another disappointing season, and the team looked completely disinterested in their bowl game against Notre Dame. Miami was favored by 3, and lost by 16. Pittsburgh Panthers — Dave Wannstedt was forced out of Pittsburgh, and the players responded with a resounding 17 point win against Kentucky (Pitt were 3.5 point favorites). Players afterward said they felt responsible for Wannstedt’s dismissal, and were playing for him (in a “sendoff” type fashion). So all teams with issues over the last 2 years performed 2.5 points better than expected. 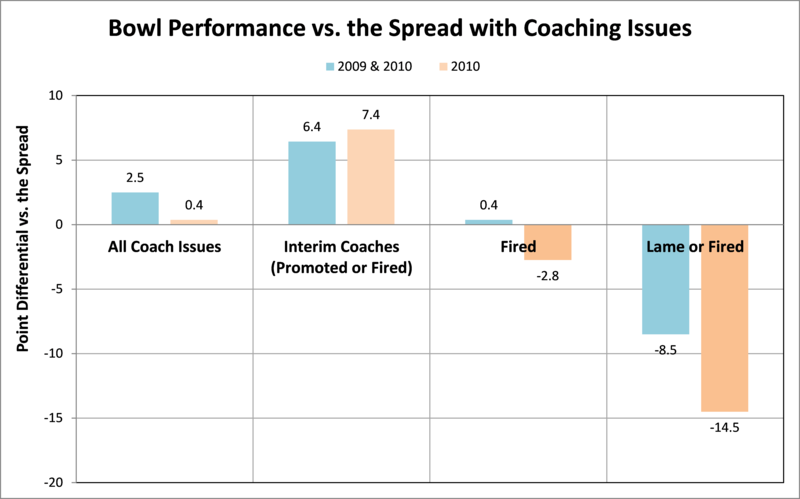 Interim coaches, whether coaching due to a firing or promotion, out-performed the spread by almost a touchdown. However, when we limit the view to situations where the coach was fired performance is flat over the two years, and dropped by about a FG in 2010 alone. Only when the fired coaches and lame duck coaches are lumped together to we see the real drop in performance, by one to two touchdowns. Interestingly, teams who fired their coaches before the bowl game were 3-1 over the two year time-period, so decreased production did not necessarily equate to losses. The main reason for combining the ‘Fired’ and ‘Lame Duck’ categories is that Texas A&M technically falls into both buckets. Mike Sherman was fired as head coach, and interim coach (and DC) Tim DeRuyter is kindof a lame duck, in that he’s leaving to coach Fresno State, but staying on for the bowl game (to me that is more “lame duck” than “promoted”). NU fans can hope that these data from the past two seasons are indicative of future performance, and that Texas A&M plays two scores worse than expected. It should be noted that these results are based on a very small sample size. Only 14 bowl teams in the last two years were impacted by a coaching change. This year there are a whopping 13 teams impacted, so we’ll continue to track this throughout bowl season. Posted on December 19, 2011, in Saturday Morning Stats. Bookmark the permalink. 1 Comment.